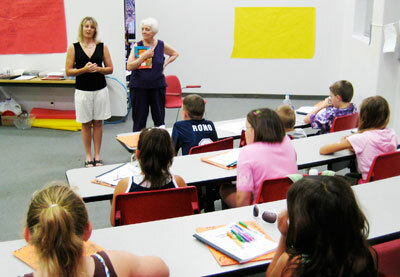 Ann Theodori, left, introduces children's author Jo Harper to students participating in Sam Houston State University's Young Writers Camp. A Sam Houston State University creative writing program for third through eighth grade students has sent home 34 participants with the inspiration to go above and beyond the basics of TAKS testing. The program was held for the past two weeks in the Evans Building. Theodori said that the Huntsville school district provided 15 scholarships, and the program is expected to grow to about 60 students next summer. One of the highlights was a visit by children’s book author and storyteller Jo Harper, who displayed her books, told the stories and talked about the characters she has created, and answered questions. In one story “Jalapeño Hal,” a cowboy from the Big Bend area of Texas, saves the town of Presidio, which is suffering from severe drought. One of the town’s residents, a youngster who made friends with Hal when Hal rode in for his infrequent visits, had to ride out to find him. “He liked rattlesnake stew with lots of jalapeño peppers,” Harper said of Hal. And that’s where the lad found him, having his favorite meal. Hal comes to town and has everyone gorge themselves on jalapeño peppers. Before long the steam coming from all those peppers they had eaten rises above the town and creates a saving rainstorm. Another of the Harper favorites is about “Outrageous, Bodacious Boliver Boggs!,” who is always late for school but has interesting stories for excuses. The teacher and children don’t believe him, until a bear shows up at their window with something he had taken from Boggs. Harper credited her mother with sparking her creativity. The Young Writers Camp is part of a larger program called the Sam Houston Writing Project, a collaborative effort between two departments--English, and language, literacy and special populations. The Writing Project also conducts a 16-day summer workshop for area public school teachers, offering six hours of graduate-level credit.